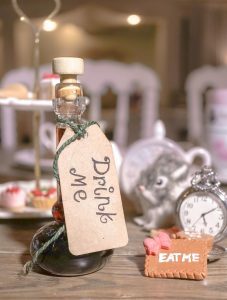 With over 40 film and television adaptations made since it was first published in 1865, the surreal story and characters of Alice in Wonderland are still inspiring parties all over the world. Whether you’re throwing a party for your birthday, or your unbirthday, follow these steps for a tea party that’s worthy of Wonderland. Large novelty versions are best for decorations, as you can just scatter them across a flat surface. If your tea party is going to take place over a few tables, mark each as one of the four suits and include a card in every invitation so your guests know which table they’re assigned to. Make sure your guests know what to do with the foods and liquids you’re providing with some helpful labelling! Tie small tags saying “Drink Me” to each teapot handle (or around each wineglass stem, choice of drink depending), and write “Eat Me” on cupcakes or biscuits in icing. Aim for tiered plate stands and elegant platters loaded with small cakes, cucumber sandwiches (with the crusts cut off, of course), petit fours, and scones with jam and cream. Cupcakes decorated with small red hearts will fit in perfectly, and don’t forget to label them or your guests might not know what to eat! Depending on how many people you plan to invite, you may want to assign each of your guests a character to dress up as. If costumes aren’t on the table, but you still want to capture the madness, leave a small costume item at each place setting. White bunny ears for the white rabbit, a crown for the Queen of Hearts, caps for Tweedle Dum and Tweedle Dee, a black headband for Alice, a top hat for the Mad Hatter, and a plastic cigarette holder for the Caterpillar are enough to get people in the spirit of the story. If you’re more interested in the party than the tea, substitute hot tea for tea infused cocktails served in tea pots. To be true to the Alice aesthetic, use a mixture of mismatched tea cups and tea pots, but don’t forget to check for sleeping door mice before you pour.